The weather was a little on the slippery side, but we still had a great turnout and lots of fun. So much so that we wish next year’s was here already. 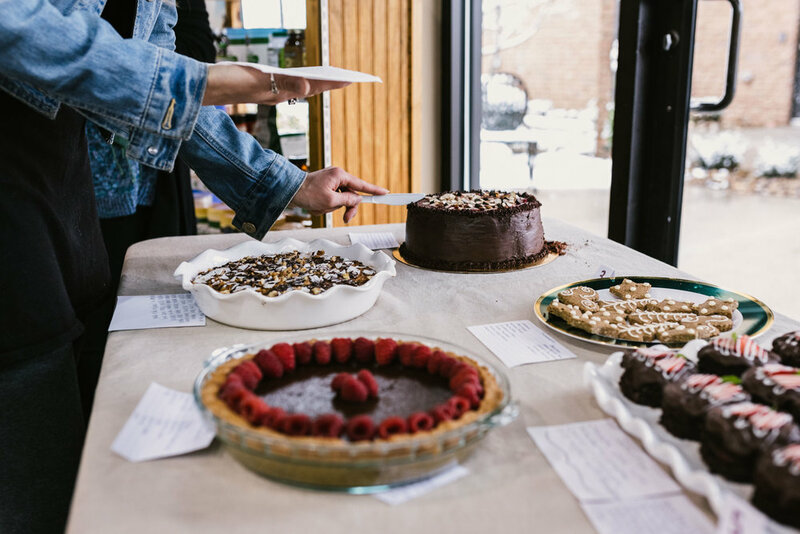 In case you didn’t have a chance to come out as a participant or as a taster (a VERY important job), the basic rundown of the event was that contestants created gluten-free Christmas desserts and brought them in to be graded for their flavor and appearance. After our esteemed judges had a chance to savor each dessert, we asked our staff and customers to try each dessert and cast their own votes for which was their favorites. 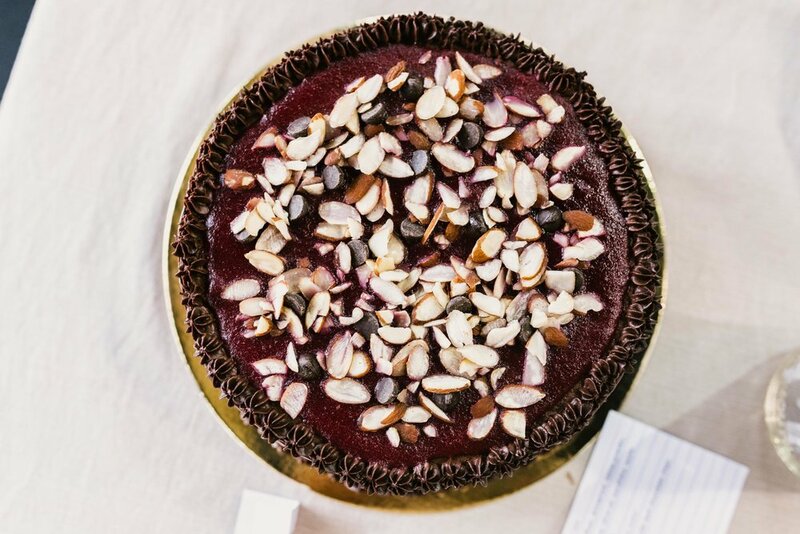 In addition to being gluten free, some of these desserts were paleo or even vegan! The open house had more to it than just the competition, however. Good Karma Tea Co. and Yogi G Natural Products were in the store to sample and talk about their goods.Our bulk manager Jake operated a popcorn machine behind the health-and-beauty counter, seasoning the snack with pink Himalayan sea salt and butter-flavored coconut oil. Additionally, samples of chocolate were provided next to a jar of candies that customers attempted to win by guessing the number of treats inside. The winner, Owen Mayfield, got it exactly right with an estimate of 495! Our first- and second-place winners for the bake-off were chocolate strawberry cakes with compote and paleo chocolate fudge pie, respectively. Their take-home earnings were gift baskets which included items graciously provided by Lily’s, Jovial, Sweet Leaf, Coconut Secret, One Degree, Namaste, Swerve, and Glee (many, many, many thanks!). All contestants, though, brought in something that made the voting process deliciously difficult; the results were so close! 1. In a mixing bowl, whisk together the dry ingredients. 2. Make a “well” in the mixture. Add the eggs, milk, oil, and vanilla, and beat until combined with an electric mixer. 3. Add the cup of hot water and beat again, it’s now time to prepare your pan. 4. To prepare your pan, cut a piece of parchment paper to fill the bottom of a cookie sheet. Pour the batter. Slam it on the counter to get the air bubbles out. 5. Place in the oven for 15 to 20 minutes or until toothpick comes out clean. 6. After cake is out and cooled a little, place it on a wire rack and remove the paper. 7. With a circular cookie or biscuit cutter, cut the cake to the desired size. Set aside until the rest of the components are made. 1. Dissolve cornstarch in water, then add sugar. 2. Stir until dissolved and add strawberries and syrup. Bring to a boil. 3. Cook until it thickens (about 10 minutes). 4. Take off heat to cool completely. While cooling it will thicken more. 5. After cooling, spread the compote between pieces of the chocolate cake, making small “sandwich” cakes. 1. In a microwavable bowl, put in chocolate chips and coconut oil. 2. In 30 second intervals, melt the chocolate until smooth, then put a generous amount of it on the top of each cake. 3. Use this same process for the white chocolate, but instead of putting directly on the cake, put in decorating bag and drizzle over thinly sliced strawberries garnished on top of the chocolate cake. Optional: add a tiny mint leaf for garnish as well. 1. Place almond flour in food processor. 2. Add sugar, salt, coconut oil, and egg. Pulse until ball forms. 3. Press over bottom and sides of 9” pie plate and set aside. 1. Melt chocolate and coconut oil in small pot. 2. Remove from heat and add coconut cream. 3. In large bowl, mix eggs, sugar, vanilla, and salt. 5. Pour into crust and bake for 28 minutes at 350 degrees. 6. Refrigerate for four hours before serving (very important for the pie’s texture). 1. Mix all materials into a dough. 2. Roll out dough on parchment paper to 1/4” thick. 3. Put the dough in the freezer for 10 minutes until stiff. 5. Bake on parchment at 350 degrees. 6. Watch carefully, baking for only 10 to 14 minutes. 2. Line an 8” round cake pan with parchment paper. 3. Whisk together the first seven ingredients in a medium bowl. 4. In a separate bowl, whisk together syrup, oil, aquafaba, vinegar, vanilla, and milk. 5. Add the wet ingredients to the dry and stir to mix well. The batter will be pourable, but not too thin. 6. Pour the batter into the cake pan and smooth the top. 8. Remove from the oven and allow to cool in the pan. 9. Remove pan and follow directions to ice and decorate. 1. Bring all the ingredients to a boil in a 2 quart heavy pan over medium heat, stirring occasionally. 2. Reduce heat and simmer uncovered, stirring occasionally until thickened (about 20 minutes). 3. Force jam through a fine mesh sieve to remove skins and seeds. Cool Completely. 1. Place chocolate in a heat-proof bowl. 2. Bring milk to almost a boil and then pour over chocolate. 3. Allow to sit for a minute before stirring together until smooth. 4. Cool at room temperature for two hours, stirring occasionally. 1. Place one cake on the plate. 2. 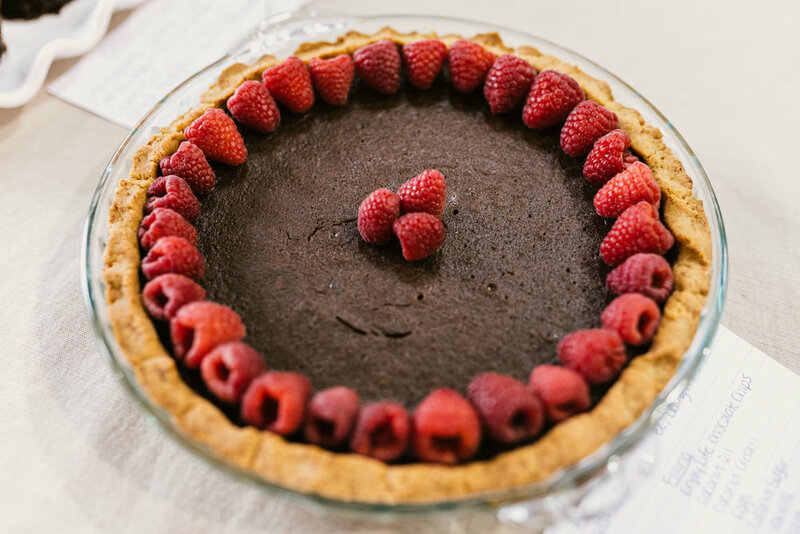 Form a border with ganache along the top and edge and fill with jam. 3. Top with second cake. 4. Spread ganache on the top and sides of the cake. 5. Garnish with almonds as desired. 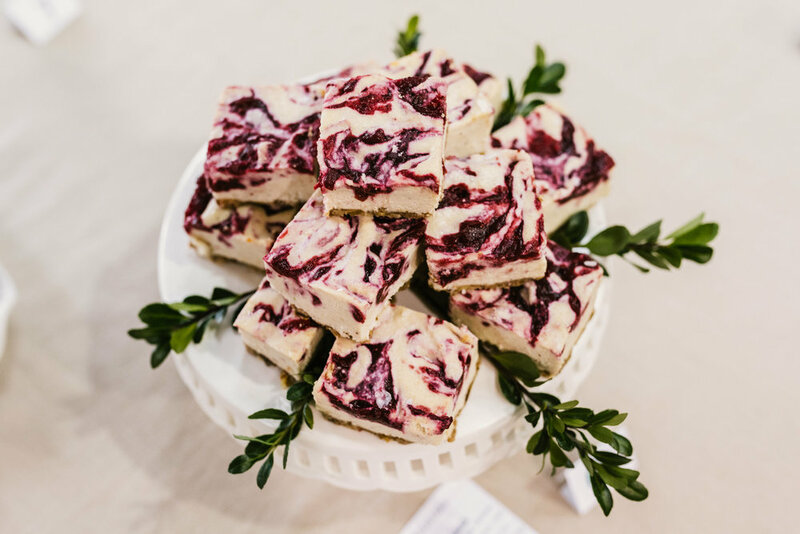 Thank you again for participating in (even if just by reading this post) our 2nd-annual holiday open house and gluten-free Christmas dessert bake-off! We will be closed on Christmas day and on December 26, but we will see you again when we re-open our doors at 9 a.m. on December 27!